Reading a few books set in Paris will get you yearning for an overseas adventure. If your children are too young to appreciate a trip to the City of Lights, I recommend curling up with a few picture books featuring croissants, baguettes, macarons and crêpes (hmm, I may be a little hungry) and taking a little armchair holiday. I’ve collected some of my favorite picture books titles featuring the famed French city for this list and you will be able to find even more on your library’s shelves. For older kids (and discerning grown-ups) see my list of Paris chapter books. Bon voyage! Let’s Go, Hugo! I first learned of this adorable book when MaryAnne of Mama Smiles interviewed the Angela Dominguez (you can view the interview on YouTube). Hugo is a bird who explores Paris on foot until one day at the invitation to fly over the Eiffel Tower he realizes he must overcome his fear. A lovely, must-read book. Mr Leon’s Paris . I don’t normally include books I haven’t read yet, but the library still has this book on order (argh) and I can’t wait to see it. Mr. Leon drives a Paris taxi, encounters people from all over the world in his multicultural city. The Mighty Lalouche . When a quirky and small postman named Lalouche loses his job, he decides to try his hand at boxing. After all, being a postman has made him “nimble and strong.” A charmingly humorous and fun story with whimsical illustrations by the wonderful Sophie Blackall. It also includes historical notes about French boxing and the electric car. Also available as an ebook. The Moon Was the Best . Gorgeous photographs by Tina Hoban accompany Zolotow’s text, which follows a parent’s memory of sharing Paris with her child. And as all parents know, some of the best memories have nothing to do with major landmarks and tourist traps. A lovely book. Kiki and Coco in Paris is another book with luscious photographs you will want to climb right into. A girl and her doll travel by plane to Paris and enjoy all its wonders. This book reminded me of all the imaginary trips I took with my dolls when I was a kid. Also available as an ebook. Adèle & Simon . I am a long-time fan of Barbara McClintock’s beautiful old-fashioned illustrative style and this is one of my favorite Paris books. Adèle and her little brother, Simon, travel through the sights of Paris on their way home from school. Absent-minded Simon loses an item at every turn and readers are challenged to find the lost items in the elaborate drawings. Terrific end maps detail the children’s journey through the city. The Tale of Hilda Louise . I really wish this book was still in print. If you find a copy in your library, be sure to read this story of a red-headed orphan who, when she grows bored of embroidering 2,357 handkerchiefs, finds herself floating across the city, looking for her heart’s desire. Mirette on the High Wire . The Great Bellini teaches Mirette his high-wire tricks, but it is the younger funabulist who teaches him to overcome his fears. McCully’s Caldecott winning illustrations may remind you a bit of Toulouse-Lautrec’s paintings. Eloise in Paris . The incorrigible Eloise goes to Paris (with Nanny, Weenie, and Skipperdee, of course). It’s rawther exciting there, don’t you think? It will be impossible to read this book and not immediately book a flight to the City of Lights. Also available as an ebook. Adelaide: The Flying Kangaroo . In this enchanting 1959 classic story, a winged kangaroo flies to Paris, where she she finds adventure, friendship and love. Everybody Bonjours! With it’s tightly controlled rhyming text, this is the perfect book to introduce toddlers and preschoolers to Paris. A little girl “bonjours” her way through the city, engaging in all sorts of kid-friendly activities. This is Paris . Sasek’s classic, stylish, retro-graphic ode to Paris is a wonderful introduction of all Paris has to offer, both the great and the small. Madeline . Now, I know I don’t need to give any sort of explanation for this classic! Chasing Degas is a sweet book with one of Degas’ famous ballerina’s as the central character. She finds Degas’ bag of paints and hunts through the alleys and streets of Paris to return it. Along the way she encounters other famous artists at work. Great for ballet and art lovers. The Red Balloon is the book based on the brilliant movie of the same name. Even though I’ve only seen the film once and more than 20 years ago, I still recall its powerful depiction of one boy’s day with balloon, the themes of friendship and loneliness as he has to battle bullies. The book doesn’t have exactly the same effect as the film, but it’s worth checking out. Anatole . In lieu of payment for the cheese he nibbles after hours at a cheese factory, Anatole leaves notes with suggestions for the owners. As a reward for the factory’s subsequent success, the little mouse is made VP in charge of Cheese Tasting. Also available as an ebook. The Mona Lisa Caper . In this romp of a story, the Mona Lisa herself narrates her experience being stolen from the Louvre in 1911 and taken to Italy. Minette’s Feast: The Delicious Story of Julia Child and Her Cat . Through the story of Julia’s cat, Minette, kids can learn about Julia, Paris and get very, very hungry. The Incredible Painting of Felix Clousseau . I loved this absurdly amusing book about an artist who enters his portrait of a duck into an art exhibit. At the show, the duck begins to quack and wanders out of the painting. In fact all over Paris, paintings begin to transform. Kids will enjoy the surprise twist at the end of the story. 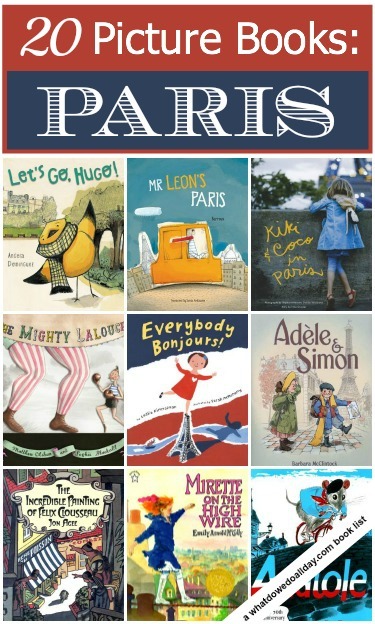 There are lots more books starring Paris out there. I’ll be making a chapter book list soon, too. Do you have any favorite Paris books? Disclosure: This post contains affiliate links. Including affiliate links helps support the time it takes for me to make these free book lists for you. Thanks for your support. Oh, what a fun idea, Danzel. What a great collection of books! How many books are there that are based on movies (apart from Disney movies)? I definitely need to get a copy of that last book! “Crictor” by Tomi Ungerer which may or may not be in Paris, but I can’t imagine it being anywhere but Paris! Henri’s Walk almost made it on the list! I love Saul Bass’ graphics. I thought about Crictor, but I didn’t have a copy with me to check and see, but you’re right that it feels like it takes place in Paris. Anatole!!! I got three of these books when I was four and they remain cherished possessions. LOVE! I can’t wait to check out the books with photographs, too. I would love to see more photography-based children’s books. Anatole is such a cute story. I’ve only read one other of the books, but I look forward to to finding the others. I think we have read most of those that you recommended here. But one we have loved when we have visited paris is Bon Appetit, Bertie. There is lots of french words and foods included with this one along with a lot of sight seeing around Paris. I don’t know Bon Appetit, Bertie, thanks for the suggestion! Oh… and I forgot another one. Crepes by Suzette. After reading this one we had to make crepes and the recipe in the book is great! Yes, I liked that one, too, especially the way they combined photographs and illustrations to tell the story. Great round up! Thanks for sharing, will have to check them out. erica, i wrote a similar post about books set in france, although i only mentioned 7 books: http://belindabrock.com/2013/03/02/books-with-a-french-accent-2/ the book that i would add to your list is belinda in paris, part of the delightful belinda the ballerina series. bien fait! I wanted to read Belinda in Paris, but was sad because our library didn’t have it! Love, love LOVE this list but it makes me want to go to Paris rather badly. Just when I wonder if bloggers have covered all the picture book lists, you come up with something I’d never have thought of. Fun stuff! Thanks for all your great lists. What a really cute idea! We’ve enjoyed a lot of these books. Visit my own book lists @ The Jenny Evolution. Great choice of books for getting to learn something about Paris! I know that it’s a city people dream of, but having lived there for more than 13 years, I know that the every day reality is a little bit different like in any too big city! Anyway, to keep on dreaming, try the reading aloud of “Un lion à Pari” I made on my website at http://atelierstorytime.com/2013/06/03/its-french-storytime/, then click on the book cover and you’ll find yourself on “it’s storytime” page, where all my readings are. It’s a story of a lion going to Paris; the statue mentioned at the end of the book really exists in Paris, in place Danfert Rochereau. The story I read online is in French as it is the language in which the book was first published but I know it has been translated in many languages. Thanks for the list! I always loved the book “Minou” as a kid, about a cat who has to learn to survive on her own when her owner dies. She becomes a mouser at the Notre Dame.